Nice WW2 era "morale set" and one of the few new radios produced during the war. Many were purchased by soldiers, and families also purchased these for their sons and daughters serving in the military to enable them to hear the news and music, keeping their morale up. Though it sold for only $20 when first produced, back then that was a month�s pay for a GI. Echophone, an older name brand, was purchased by Hallicrafters as Echophone was on the brink of insolvency. 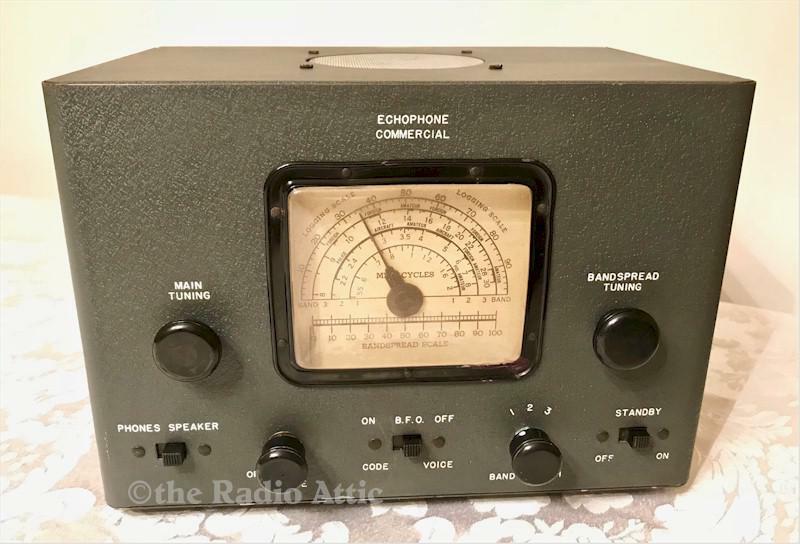 The electronics have been completely restored (no shortcut repairs and it is internally fused for your safety), and it plays well on both the AM and shortwave bands. I've added an MP3 input for your listening enjoyment should you wish listen to your own supplied music, especially music from the WW2 era. The cabinet does show some wear, but is very presentable. The lower bottom right corner of the plastic dial cover does have a very small chip that might not be visible in the pictures. 10-3/4"W x 8-3/4"H x 7-1/2"D.